If this is your one chance buy a laser rangefinder that you hope will be your last purchase for years to come, then you’re in the right review. You want the best optics and the most brilliant reflectivity when you’re not only willing to write a blank check for the perfect rangefinder. Look no further, because the Leupold of your dreams is exactly what you’ve been looking for. Leupold is one of those brands where you expect consistently high quality and astute attention to detail. They’ve been trusted for over 100 years to deliver sport optics that just get better and better as time goes on. You know they’re a brand worth trusting and investing in when they offer state-of-the-art technology that’s been years in the making. The GX line of Leupold rangefinders were 2012’s pride and joy. Since then, Leupold quickly went back to work to make that line even better. Their new line of GXi2 and GXi3 rangefinders are all equipped with the new, more accurate, and faster than ever Digitally Enhanced Accuracy (DNA) engine technology that’s supposed to be unmatched. All of their golf laser rangefinders are fully waterproof, tournament legal, and are made to endure. If you’re committed to the green, put a ring on it – excuse me, I meant a Leupold. 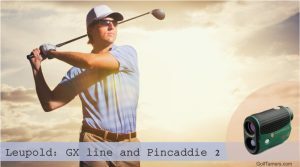 There’s no golf game that’s complete if you don’t have a GX.